This is a simple, tasty and cooling recipe that is great for kids and adults alike. Looking to cool down with a healthy treat this holiday weekend?? 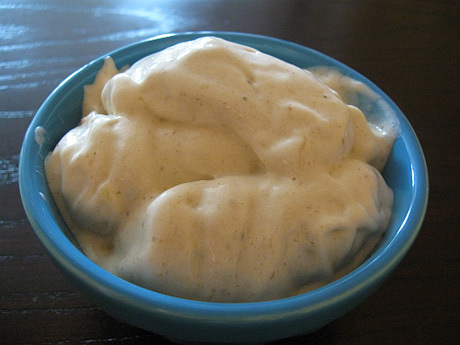 Try this healthy homemade banana ice cream instead of the regular stuff that is full of sugar, void of fiber, has a ton of saturated fat and a bunch of other unknown ingredients! Trust me, your taste buds and your body with thank you. Bananas are great for digestion helping to promote healthy bowel movements. Bananas can ease both constipation and diarrhea. It is also a great source of potassium and is helpful after a bout of diarrhea to re-hydrate. I made this for my 'better half's' parents a few weeks ago when we had them over for dinner. My boyfriends father is a total ice cream addict, so I decided that he would be my best critics when it comes to my all natural, 1 ingredient, ice cream. The result = he loved it!! It was a true success. The next time you are having company over try it. Especially great for kids and ice cream addicts!! Process frozen bananas in a food processor for 5-10 minutes until they reach a smooth and creamy texture similar to soft serve ice cream. You will have to scrap down the sides a few times. Also note; hold machine when you first start to break down the bananas as it can be a little jumpy to start. Peel bananas and cut into small chunks. Freeze in a ziploc for at least 24 hours before making this creamy and delicious delight of a recipe. Please share!! What is your favorite healthy treat to cool down in the summer! I love ice cream, too - but I make mine at home with a coconut milk base. Thanks for this wonderful and simple whole food dessert! Sounds Delish Tara!! What is your fav kind of ice cream to make?